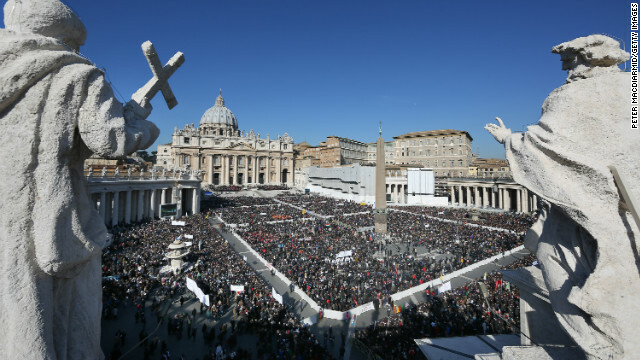 The faithfull fill St Peter's Square ahead of Pope Benedict XVI final general audience before his retirement on February 27, 2013 in Vatican City, Vatican. Editor's note: Cardinal Theodore McCarrick is the Archbishop Emeritus of Washington, D.C. He participated in the 2005 election of Pope Benedict XVI. Watch Cardinal McCarrick on The Situation Room today at 6 p.m. ET. (CNN) - The world is waiting on the next pope in more ways than one. Everyone, including the College of Cardinals, is wondering who the next Bishop of Rome and leader of the world's billion Catholics will be. But the world is waiting in another, more urgent sense, because the pope isn't just a spiritual leader to Catholics. His work has a global dimension. As has been true in the past, the next pope will have to provide a moral voice to a range of challenges. An estimated 1.7 billion people live without adequate health care or decent living conditions and more than 1.3 billion live below the measure of extreme poverty. Some 870 million people are chronically malnourished. Jesus identified himself with the poor and the marginalized and all Christians have a responsibility to them. But the pope, as Servant of the Servants of God and Vicar of Christ on Earth, bears a special burden. HIND, HELL FOR HIS HINDUISM TERRORISM BY HINDUISM DENIAL OF TRUTH ABSOLUTE IN FOLLOWING OF HINDU JUDAISM, FILTHY SECULAR ISM TO HIND FOOL HUMANITY IN TO HINDUISM DENIAL OF TRUTH ABSOLUTE GOD AND PRETENDING TO BE A HINDU SANATAN, FILTHY GOON MAN GOD TO IMPOSE HINDU CRIMINAL HINDUISM RACISM. IT IS TIME TO GIVE THEM GLYCERIN SUPPOSITORY. the biggest challenge new Pope face would be.....who is going to run the churches, if their priests are tried for child s ex abuses and locked up? immediate thing comes to my mind is.....s ex abuse cover up charges!! My take: The next pope will face rampant se xual abuse scandals involving ho mo se xual priests praying on little boys. I believe someone stole this handle, there is a troll on here that spews the same stupidity over and over. Ah, thanks, dot. I wasn't sure if it was the real HBDC. Jeez, Rality, you're one gigantic boorish bore. Lamorpa, if you can get this guy to stop, you would be doing a great service to us all. His c/p vanity writing nonsense has been annoying for a loooooooong time.